On this day, SID & GP and the GMP inspectorate of the Center for State Control of Medicines and Medical Devices of the Cuba’s National Regulatory Authority (CECMED) signed an Agreement on Cooperation in the field of inspections of pharmaceutical manufacturers for compliance with the requirements of Good Manufacturing Practice. 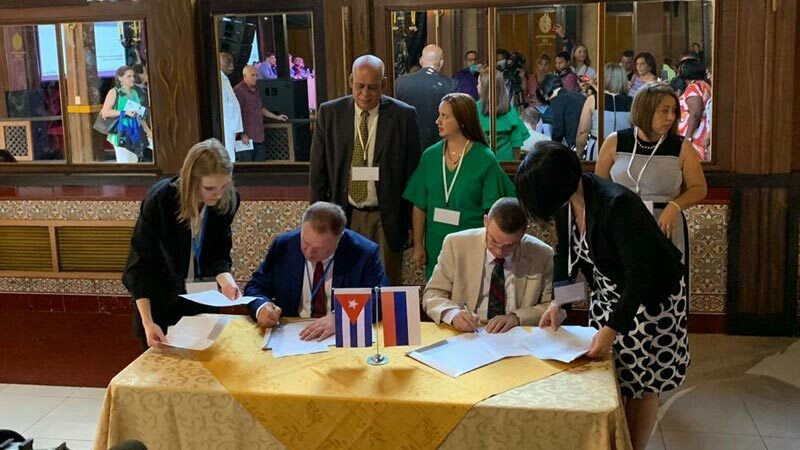 The Deputy Head of the Russian GMP inspectorate, the Director of SID & GP Mr. Vladislav Shestakov and the Director of the Cuba’s Center for State Control of Medicines and Medical Devices (CECMED) Dr. Rafael B. Pérez Cristiá signed an Agreement of Cooperation. According to the document, the inspectorates of the two countries agreed on mutual informing about upcoming inspections and participation of the parties in GMP inspections as observers. Besides, SID & GP and CECMED are planning to carry-out joint training inspections and workshops to upgrade the qualification of their inspectors. One of the clauses of the Agreement is related to joint activities towards fighting against counterfeit medicines. «Considering the increasing level of globalization in manufacture of drug products and pharmaceutical ingredients, it is of utmost importance to establish and strengthen cooperation between the pharmaceutical inspectorates of the both countries. This is needed for enhancing mutual trust and improving security,» the parties commented on the outcomes of formalization of their cooperation. «It is symbolic that we are signing the document on the days of celebrating the jubilee of our Cuban colleagues,» Mr. Vladislav Shestakov emphasized and expressed his hope for establishing partnership relations which will facilitate elaboration and provision of fulfillment of common regulations, standards, approaches, and requirements in terms of good practices: «And needless to say, our cooperation will promote the growing turnover of pharmaceutical products between our countries».